The beautiful, treeless, windswept Outer Hebride islands, with their mountainous spine, are located in an area with countless lochs, rivers, inlets and pools. There’s an almost infinite variety of wildlife for nature lovers. Though primarily a land in which to marvel at natural rather than manmade things, the islands offer some marvelous historical structures.The most northerly of the Hebrides are Lewis and Harris Islands, connected to each other by a land bridge. 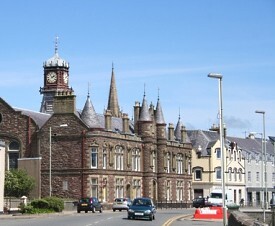 Stornoway is the largest town on Lewis, an island that features Neolithic tombs and stones and an Iron Age tower, reflecting its ancient history. It is the place to shop for beautiful Harris tweeds.